The TECHT FANG Trigger is the highest quality billet aluminum, best feeling trigger available for Tippmann 98's, 98 Customs, the new 98 Custom Pro E's, AND ANY OTHER TIPPMANN THAT TAKES A SIMILAR TRIGGER. 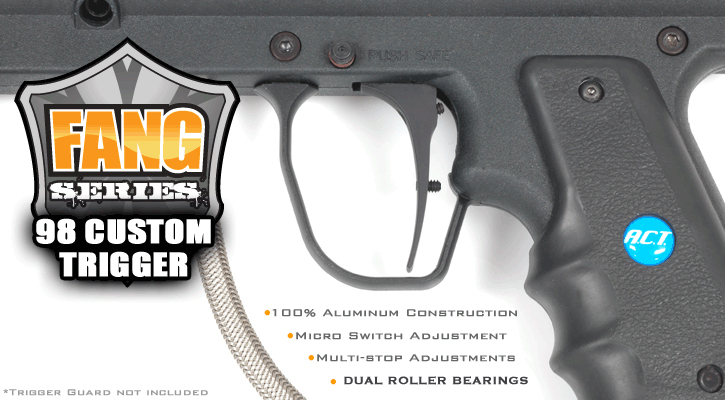 The trigger has been designed to work on all models of Tippmann 98's, including Mechanical, Response/RT, and E-Grip. The Fang triggers are three point adjustable and allow for the shortest trigger pull possible. Walking the trigger will be easier than ever before. You can adjust how far the trigger moves before actuating the switch, where in the trigger pull the switch is activated, and how far the trigger moves after actuating the switch. The Billet Aluminum construction is more durable and realistic than the plastic of the stock and other competitors' triggers. The three adjustment points are not just for the E-grip. They also change where the sear is released and where the RT piston rests, making it easier to find and hold the "sweet spot" on the RT. The Fang also benefits the mechanical trigger by giving a lighter trigger pull and unparalleled adjustability. The Fang also includes three variable strength trigger/sear springs for even more adjustability. The FANG Trigger for the 98 now comes with dual roller bearings installed for the best and smoothest trigger pull. This trigger does not come with a trigger guard as shown in the picture. The one in the picture above is using the Tippmann 98 Double Trigger Guard. They are available from Tippmann for a few dollars. Replacement trigger return springs for all Tippmann Markers. The stiffer springs in this kit can be used to replace sear springs as well.